Breamore is a village in Hampshire where a brass “Byzantine bucket” was discovered by a metal detectorist, leading to the excavation of an Anglo-Saxon burial ground. After presenting a live dig from Breamore in 2001, the site was so interesting that Time Team returned for a rare four-day investigation, discovering unusual double burials, more buckets, and a spearhead, all of which shed new light on the Saxon period. 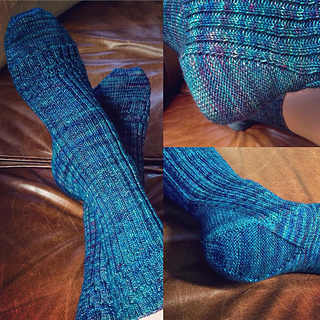 These socks are ribbed and feature a Strong-style heel. Designed to play nicely with self-striping yarn, they knit up surprisingly fast. But the fun part comes in the heel turn, where some fancy stitchwork creates a nice diamond of purl stitches, much like a spearhead. Breamore was featured on Time Team in season 9, episode 13: Seven Buckets and a Buckle. This pattern uses p2togtbl (purl two together through the back loop). A video of this technique is available on YouTube.